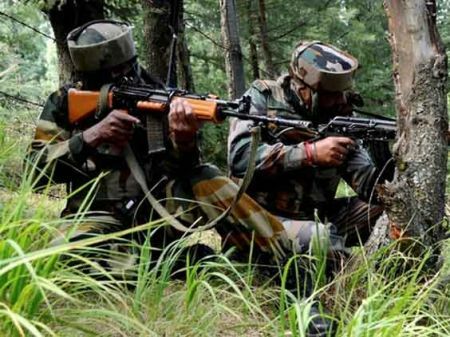 In a fresh ceasefire violation ahead of the prime minister’s visit, Pakistani Rangers on Wednesday resorted to mortar shelling in Akhnoor sector of Jammu district leaving a woman dead and three others injured, including a Border Security Force jawan. The firing also triggering an exchange of fire with BSF troops, which was still going on when last reports came in. “The Pakistani Rangers opened ‘sniper fire’ on a BSF constable guarding a border outpost along the International Border in Kanachak sector of Akhnoor tehsil in Jammu district around 8.45 am,” a senior BSF officer said. As BSF troops tried to evacuate the injured jawan in a vehicle, they were heavily fired upon by Pakistani Rangers, he said. Ahead of Prime Minister Narendra Modi's visit to Jammu, Pakistani Rangers on Wednesday violated the ceasefire twice by resorting to firing and mortar shelling in Akhnoor sector in which a woman was killed and four others including a Border Security Force jawan was injured. "The Pakistani Rangers opened sniper fire on a BSF constable guarding a border outpost along the International Border in Kanachak sector of Akhnoor tehsil in Jammu district around 8:45 am," a senior BSF officer said. As BSF troops tried to evacuate the injured jawan in a vehicle, they were heavily fired upon by Pakistani Rangers, the officer said. The BSF troops took positions and retaliated, resulting in exchange of fire. in Bhalwal Bharth, Malabela, Siderwan areas and Border outposts (BoPs) at 9:10 am, a police officer said adding it stopped at 12 pm on Wednesday. Three mortar shells landed deep inside Kanachak sector along the international border, they said. Poli Devi, 42, died in the mortar shelling while Ramesh Kumar, 24, and Udha Devi, 38, suffered injuries, the officer said. The firing and shelling was resorted to by 21 Chenab Rangers (Pakistan) from their Azam, Peer Garana, Melabela-Stop on Siderwan and Malabela BoPs of BSF on this side. Prime Minister Narendra Modi will visit Jammu on Friday (July 17) to attend the centenary celebrations of former state Finance Minister Girdhari Lal Dogra. Pakistani Rangers resumed firing of 82-mm mortars along IB in Kanachak sector around 3:40 pm, a BSF officer said adding that exchange of the firing is going on when the reports last came in from the area. This is the eighth ceasefire violation in this month. On July 9, Pakistani troops fired at a forward border post in North Kashmir killing a BSF jawan, a day ahead of talks between Modi and his Pakistani counterpart Nawaz Sharif in Russia. On July 5, a BSF jawan was killed in Pakistani firing along LoC in Nougam sector in Kashmir valley. Mr Modi, why this change of heart about Pakistan?